We will discuss about how to create tcp port Scanner using python? Or how to create tcp port scanner using socket, threading modules in python? Or how to create an simple tcp port scanner with python? Or create own port using python? Or port scanner Example using python? Etc.. Here , Some Question Normally Comes on beginners mind. Ans. Transport layer protocols, such as the Transmission Control Protocol (TCP) and the User Datagram Protocol (UDP), specify a source and destination port number in their headers. A port number is a 16-bit unsigned integer, thus ranging from 0 to 65535. Q. What is an port Scanner? 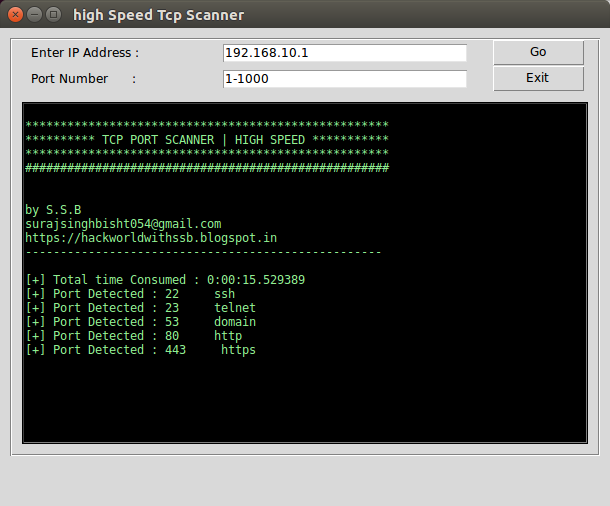 Port scanner is an application designed to probe a serveror host for open ports. This is often used by administrator to verify security policies of their networks and by attackers to identify services running on a host and exploit vulnerabilities. A port scan is a process to find available ports and their status. basically, In Port scanning, port scanning softwares sends client requests to a range of server port addresses on a host, with the goal of finding all active port; this is not a nefarious process in and of itself. The majority of uses of a port scan are not attacks, but rather simple probes to determine services available on a remote machine. To port, a sweep is to scan multiple hosts for a specific listening port. The latter is typically used to search for a specific service, for example, an SQL-based computer worm may port sweep looking for hosts listening on TCP port 1433. Q. What is the functions of socket module in python? Ans. The socket module exposes the low-level C API for communicating over a network using the BSD socket interface. It includes the socket class, for handling the actual data channel, and functions for network-related tasks such as converting a server’s name to an address and formatting data to be sent across the network. 4. time For Recording Process Timings. This Script is Written in python 2.7 . But You Can Also Try this on python 3.5 with Small Changes in Script. I created This Script only for Practise Purpose and for python programming beginners. This script is very easy to under stand and easy to maintained and it is a good example of socket module usages with threading.